[Updating] The Bermuda Men’s Football Team is matching up against Aruba this evening [Sept 9] as part of the inaugural Concacaf Nations League Qualifying Round Match taking place in Curacao with a kick-off time of 7.00pm. 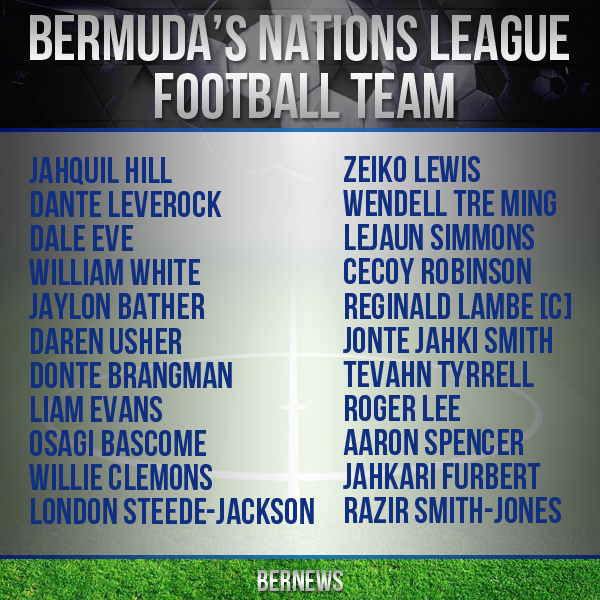 Bermuda Men’s Football Team players are Jahquil Hill, Dante Leverock, Dale Eve, William White, Jaylon Bather, Daren Usher, Donte Brangman, Liam Evans, Osagi Bascome, Willie Clemons, London Steede-Jackson, Zeiko Lewis, Wendell Tre Ming, Lejaun Simmons, Cecoy Robinson, Reginald Lambe [C], Jonte Jahki Smith, Tevahn Tyrrell, Roger Lee, Aaron Spencer, Jahkari Furbert and Razir Smith-Jones. Update 6.50pm: Concacaf has announced Bermuda’s starting line up in tonight’s game as Jahquil Hill, Daren Usher, Jaylon Bather, Dante Leverock, Wendell Tre Ming, Donte Brangman, Osagi Bascome, Willie Clemons, Lejaun Simmons, Reginald Lambe [C], & Jonte Jahki Smith. Seems that they, like us, have been starved for international fixtures in recent years. So a wake-up call for the senior team. Next match will be at home and I bet the team could use the country’s support.